This Spring, the Creative Arts department at The Sixth Form College, Solihull is putting on a series of shows to celebrate the talents of their Performing Arts students. Prospective students are being invited to attend these showcases to see the sort of shows they might get involved in if they choose to enrol onto a Performing Arts course at the College this September. These courses include A levels in Dance, Drama & Theatre, Music and Music Technology. 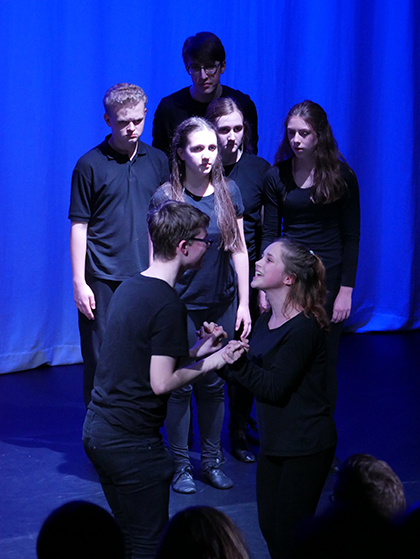 The first shows are the Drama creative adaptive plays, which will see Year 13 students performing their assessed pieces in front of an audience of students, staff and parents. These performances – on 28 February and 2 March – of “The Lovely Bones”, “Coraline”, “The Legend of Hercules” and “A Snowball in Hell” will be a final practice ahead of their assessment just days later. The Dance showcase on 21 March will feature both first and second year Dance students, also performing some of their assessed choreography. This will include both solos and group choreography and the College’s Dance Company, Collision will also be performing. The latter includes students who participate as an enrichment activity, rather than as part of their A level studies. The Easter Concert on 5 April will see A level Music students and those who take part in musical activities as an enrichment, performing in front of an audience of staff, fellow students and parents. College bands like the Soul Band will be performing, as well as the combined staff and student College Choir, who will be singing songs from “Les Miserables”. Tickets for these events are available by contact marketing@solihullsfc.ac.uk or by calling 0121 704 2581. Current students/parents can also get tickets for the Dance and Drama shows via the Parentpay website if they are registered.